Copyright: © 2016 Nesrin C, et al. This is an open-access article distributed under the terms of the Creative Commons Attribution License, which permits unrestricted use, distribution, and reproduction in any medium, provided the original author and source are credited. Meconium related gastrointestinal abnormalities could be seen in a wide spectrum from the meconium plug syndrome (MPS) and meconium disease (MD) to the severe meconium ileus associated with cystic fibrosis or Hirschsprung disease [1,2]. Among other causes of neonatal intestinal obstruction, MD is usually seen in low birth weight neonates and characterized by abdominal distension and vomiting despite spontaneous meconium passage in few days of life at most of case . Contrast enemas can be used for diagnosis and also treatment. Surgical intervention is indicated in rare conditions, e.g. failure of enema administration or perforation . Here we report an extremely low birth weight neonate with meconium disease and intestinal perforation who managed successfully by peritoneal lavage and rectal irrigation with colostrum. A female baby was born by cesarean section at the 26th gestational week to a 30-year-old gravida 1 mother with Apgar scores, 5 and 7 at five and ten minutes, respectively. The birth weight was 830 g, length 33 cm and head circumference 24 cm (both appropriate for gestational age). After birth, she was treated with antibiotics, mechanical ventilation and surfactant replacement for severe respiratory distress syndrome. Then the baby extubated to Continuous Positive Airway Pressure (CPAP) and was fed by breast milk via orogastric tube. On day 14, abdominal distention and emesis has been occurred (Figure 1). Figure 1: A; X-ray graph shows typical multiple, uniformly dilated loops without air-fluid levels, and B; X-ray graph shows a peritoneal drain. On X-ray graph there were multiple gas on abdomen so Nacetyl cysteine (NAC) given and rectal irrigation by 3% Nacl was performed. But meconium passage did not occur and distention has increased. Oral feeding was discontinued and total parenteral feeding begun. A control plain graph revealed free gas on abdomen due to perforation. Due to worsened general condition, peritoneal lavage performed (Figure 1). Since failure of enema using saline and deterioration of clinical status, we thought that colostrum might be used for rectal irrigation. Almost 5 cc colostrum was given rectally via 6 F tube. After 8 hours baby defecates and passages hard meconium (Figure 2). 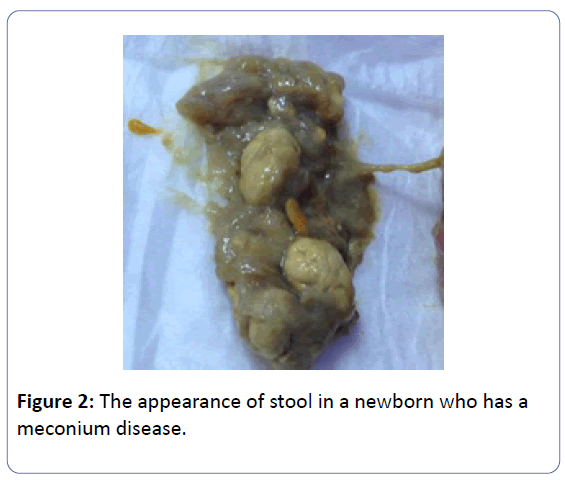 Figure 2: The appearance of stool in a newborn who has a meconium disease. After this procedure, distention has resolved and oral feeding has begun 7 days later. Peritoneal lavage catheter has removed 10 days later. Baby discharged from hospital uneventfully. As a result of improvement of neonatal care by time, the survival rates of preterm babies with low and extremely low birth weight have been increased and so gastrointestinal conditions associated with meconium become a frequent clinical problem [3-5]. MD occurs due to a combination of immature intestinal motility function and abnormal, highly viscid meconium composition in the colon or terminal ileum [2,3]. Maternal hypertension, maternal MgSO4 therapy, caesarean delivery and maternal diabetes have been reported as risk factors of this condition . Differential diagnosis should be made between following etiologies; MPS, Hirschsprung’s disease, malrotation, and intestinal atresia . MD is characterized by small bowel loops on X-ray graph, without fluid levels or pneumatosis intestinalis . There are no widely accepted criteria for management for MD but conservative approach or meconium softening enemas (saline, N-acetyl cysteine and gastrografin) can be used specially in early diagnosed cases [2,7,8]. 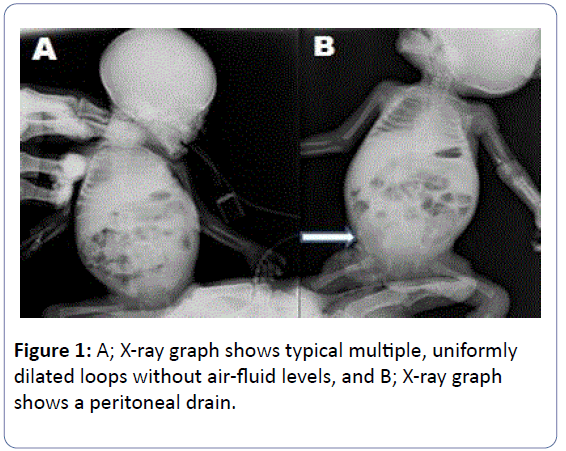 Delayed diagnosis can be result in obstruction and even perforation especially in immature neonates . We initially used the hypertonic saline and Nacetyl cysteine but they failed in providing meconium discharge. Meconium softening enemas are hypertonic solutions that lead the water from intestinal wall to lumen. But this condition could be result in extracellular liquid loss and even hypovolemia especially in preterms . Colostrum contains lactulose, and it has also hypertonic solution. As a result, it acts as a laxative and so helps feces to pass the intestinal tract [9,10]. According to our knowledge, this state is the first to show the efficacy of colostrum in treatment of MD or MPS. In this report we suggested that colostrum can be used in treatment of MD or MPS, alternatively to other enemas, because it is a natural substance and has low risk for preterm babies. In addition, further investigations are needed for determining the laxative feature of colostrums in such conditions. Kubota A, Imura K, Yagi M, Kawahara H, Mushiake S  Functional ileus in neonates: Hirschsprung’s disease-allied disorders versus meconium related ileus. Eur J PediatrSurg 9: 392-395. Paradiso VF, Briganti V, Oriolo L, Coletta R, Calisti A  Meconium obstruction in absence of cystic fibrosis in low birth weight infants: An emerging challenge from increasing survival. Ital J Pediatr 14: 37-55. Dimmitt RA, Moss RL  Meconium diseases in infants with very low birth weight. SeminPediatrSurg 9: 79-83. Vinograd I, Mogle P, Peleg O, Alpan G, Lernau OZ  Meconium disease in premature infants with very low birth weight. J Pediatr 103: 963-966. Emil S, Nguyen T, Sills J, Padilla G  Meconium obstruction in extremely low-birth-weight neonates: Guidelines for diagnosis and management. J PediatrSurg 39: 731-737. Keckler SJ, St Peter SD, Spilde TL, Tsao K, Ostlie DJ  Current significance of meconium plug syndrome. J PediatrSurg 43: 896-898. Burke MS, Ragi JM, Karamanoukian HL, Kotter M, Brisseau GF  New strategies in the non-operative management of meconium ileus. J PediatrSurg 37: 760-764. Carlyle BE, Borowitz DS, Glick PL  A review of pathophysiology and management of fetuses and neonates with meconium ileus for the pediatric surgeon. J PediatrSurg 47: 772-781. Joshi S, Barakoti B, Lamsal S  Colostrum feeding: knowledge, attitude and practice in pregnant women in a teaching hospital in Nepal. International Journal of Medicine and Molecular Medicine 3: 1-14. Schroedl W, Jaekel L, Krueger M  C-reactive protein and antibacterial activity in blood plasma of colostrum-fed calves and the effect of lactulose. J Dairy Sci 86: 3313-3320.